If you're a heavy Eclipse user, I recommend that you have a Groovy Monkey. The curious monkeys provide a way to add features to your Eclipse easily. Got a monkey? The monkey appears in your Eclipse menubar? Then push him to create the example project that the Groovy Monkey team provides. The project has good examples to help your understanding of Groovy Monkey. Job expresses the thread to execute the script on. There are three Jobs, Job, UIJob and WorkspaceJob that are defined in Eclipse Jobs API (please refer here for details). In the example, UIJob is specified because the script accesses UI. Groovy Monkey provides more DOMs. You can see them in the Outline View or the Installed DOMs View. I'll show one more example which I wrote. 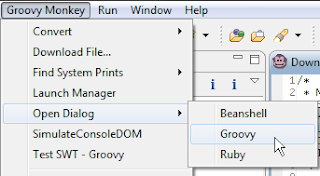 This example add a file downloading feature to your Eclipse and shows how to use workspace resources from Groovy Monkey scripts with Included metadata. To try the example, you need to get URLConnectionBuilder. I have installed it from the update site but no monkey has been added to my eclipse, do you have any idea? I tried to install Groovy Monkey 0.6.1 to Eclipse 3.7.1 on my Windows 32bit machine and I had a success. Have you checked Groovy Monkey's installation status (Help > About Eclpse > Installation Details)? Has Groovy Monkey been successfully installed?